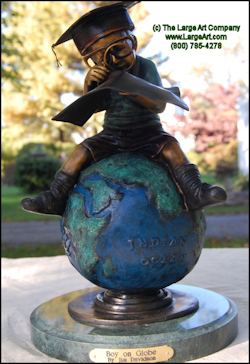 A wonderful sculpture of a Boy On a Globe studying a map. We have these cast ourselves using high quality American bronze. 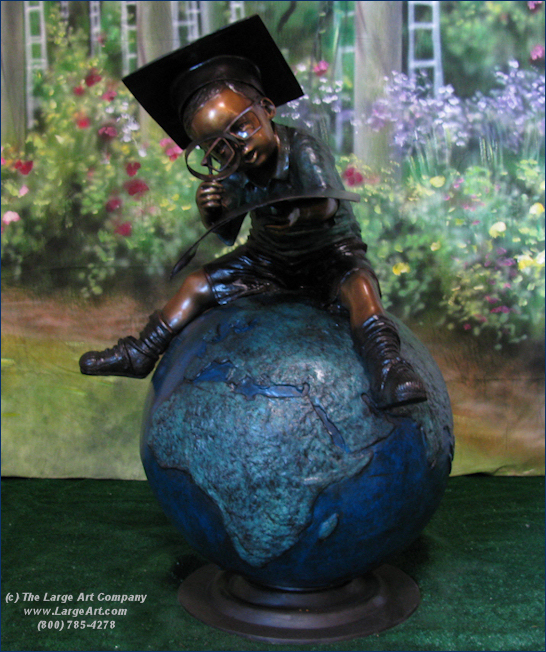 This sculpture would look great in a school or library a garden or park. For a limited time you will receive a desktop version of this piece for free with purchase (click HERE to see the desktop version)! It is intended for outdoor display and will last for hundreds of years with little maintenance. For more information about care and cleaning click here. Availability: We sometimes have this piece in stock but normally it takes 4 weeks to your door. Color - The standard way we cast this sculpture is what we refer to as multi-color. The bench is always brown, but we can also make the entire sculpture brown for a more traditional look. For more information about colors Click Here. Mounting Nuts - Mounting nuts can be welded under the feet of the bench for a secure permanent installation. For more information on installation click here.